Wood-Mode cabinetry comes in a wide variety of species, styles, and finishes. 100% OFF Door/Drawer Style Premium (50% OFF Stainless Steel & Backpainted Glass Door Styles). When it comes to cabinetry design, Wood-Mode is renowned for its excellence in material selection, construction and finishes. Their dedicated craftspeople use only the finest wood and woodworking practices to create the highest quality product. It all starts at the Wood-Mode manufacturing facility where a precise lumber drying process achieves the optimal moisture content required for stable and reliable cabinetry. Then, timeless craftsmanship techniques are combined with precision laser technology to provide complete control over the manufacturing process. Wood-Mode produces kitchen cabinetry in a broad range of styles, colors, wood species, laminates and finishes. Here’s a quick look at some of the most common wood species. Cherry – One of the most elegant options, cherry is characterized by its tight grain pattern and subtle variations in color. In a natural process called warming, cherry wood darkens with age, giving it both charm and character. Knotty Cherry – Like Cherry, but with a more rustic look that includes knots and checks. Incredibly durable. Maple – A finely grained and versatile hardwood that’s known for its distinctive burl patterns. Heartwood Maple – The more rustic version of Maple featuring natural streaks, checks, and heavier burl. This type of wood usually comes from the core of the tree. Oak – Appreciated for its prominent grain, beauty and strength, oak is a very durable and affordable hardwood species. Pine – Warm and inviting, pine is a softwood with a circular grain and random knots. It takes on an antique quality when purposely distressed. 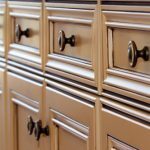 The durability of your cabinetry involves more than simply choosing a wood species. Solid wood may be ideal for raised panel doors and frame faces, for example, while other materials are more suited for sides, tops, bottoms and shelves. Wood-Mode also features an extensive selection of over 90 wood finish colors, two standard finish sheen levels, and almost three dozen standard laminates. If there’s a style you’re looking for, rest assured that Wood-Mode can meet your unique specifications. Wood-Mode Cabinets from Kenwood Kitchens! Looking to save big on some new cabinetry for your kitchen? Kenwood Kitchens can make it happen. Since opening its doors in 1974, Kenwood Kitchens has made a name for itself throughout Maryland as a complete kitchen and bathroom remodeling firm. With showrooms located in Lutherville, Abingdon, Columbia or Annapolis, Maryland, Kenwood Kitchens is the place for all of your kitchen and bathroom needs. If you are interested in remodeling your kitchen or bathroom – or, need cabinets for any part of your home, please call Kenwood Kitchens at (800) 211-8394. This entry was posted on Friday, September 9th, 2016 at 12:58 pm. Both comments and pings are currently closed.